Requirements: Brevillier Village is seeking a full time speech language pathologist to join our dedicated therapy team. Responsibilities include evaluating and treating residents in our skilled nursing, personal care, and independent living settings. The ideal candidate will have a strong background in dementia and dysphagia and a passion for person centered care. Must possess a PA SLP license and ASHA Certificate of Clinical Competence. Apply using our online application. Requirements: Must be available weekends and holidays. Requirements: Experience with floor care equipment. Requirements: Basic knowledge of Maintenance procedures, tools and equipment. Requirements: Multi-line phone, computer and office machine experience preferred. Requirements: Working knowledge of grounds maintenance; must be 18 years old to use equipment. Requirements: Excellent driving record and customer service skills. At Brevillier Village our commitment to supporting senior life, health and wellness happens because we put people first. 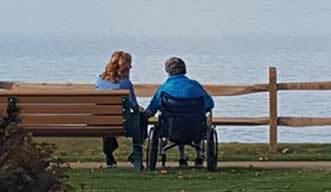 Brevillier Village has approximately 250 full and part time employees caring for 300 residents on our beautiful 20+ acre lake front campus. With such a large and diverse resident population, we welcome compassionate and caring individuals to provide our high standards of care. Brevillier Village is blessed with significant longevity in its staff. We have employees that have been here since the 1980s. People stay where they are happy and valued and the management team at Brevillier does a terrific job supporting the people who work here. Apply to become part of our team today! Person-care focus with a team approach to meeting our resident’s needs. Brevillier Village is located on East Lake Road in Harborcreek, Pennsylvania and is not on any EMTA bus routes. These pictures are of Brevillier Village’s ‘Wall of Fame’. Employees who have selflessly served our residents for at least 10 years get put onto this display in the lobby of Ball Pavilion. The smallest pictures on the wall are for at least ten years of service. Having so many employees spend decades working here says so much about the working environment. We hope you’ll want to become a member of our fantastic team too. Apply today!